The declawing process is actually a painful and permanent alteration — some would say mutilation — of a cat’s paw. See the dotted vertical line? The area to the right of that line is severed when a cat is declawed. 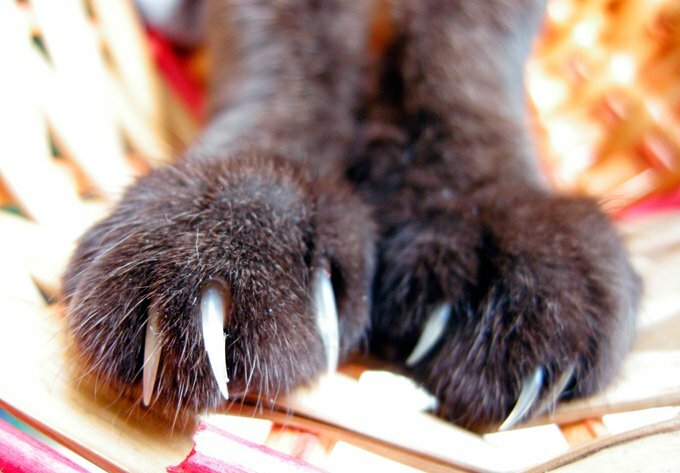 A cat’s claw isn’t like a human toenail: it is both retractable and adhered to bone. 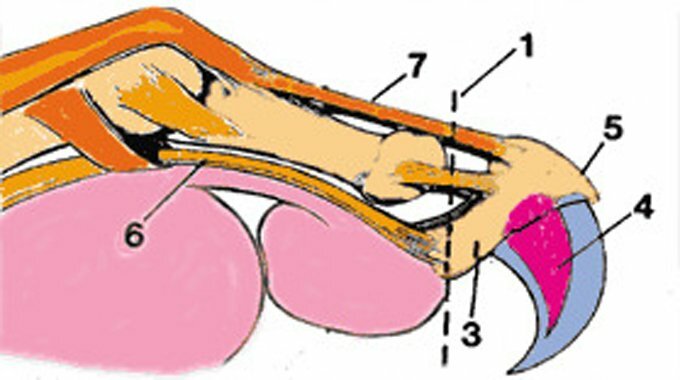 The declawing process is actually the complete amputation of the claw and the attached bone. Declawing procedures are performed by scalpel, laser surgery, or, most often, using an instrument that operates like a guillotine. The device cuts straight through the last joint of the cat’s toe with a sliding blade, removing the claw and bone right at the joint. The procedure also removes a portion of the paw pad, the protective tissue on the bottom portion of the paw. Cats are digitigrades; rather than walking on the flats of their paws like most mammals, they get around by walking on their toes. After a cat undergoes the declawing procedure, they must walk, jump, paw, and perform many of their usual activities on their toes – in essence, on healing surgical wounds. The recovery process can be quite painful for cats. According to the American Veterinary Medical Association, cats can experience chronic pain or lameness weeks after surgery. In fact, in their official position statement, the AVMA claimed declawing should be only the very last resort after all other options have been exhausted. “Declawing of domestic cats should only be considered after attempts have been made to prevent the cat from using its claws destructively or when its clawing presents a zoonotic [infectious disease] risk for its owner(s),” the AVMA website reads. Some countries, including the United Kingdom, Australia, Brazil, and Switzerland, ban declawing outright; in Israel, for instance, declawing your cat could result in jail time and a whopping $20,000 fine.